Each day over $115 million is poured through vending machines! Vending is one of today's fastest growing industries. Every day nearly 7 out of 10 people will do business with some kind of vending machine - the fantastic potential for this business has only begun to be fully realized. 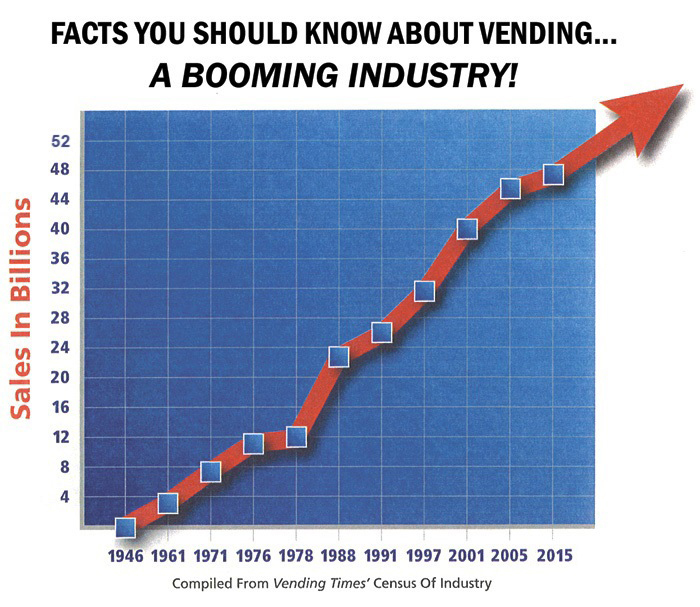 Not only is the greatest growth of vending ahead of us, but also the greatest diversification of vending is yet to come! Every 15 minutes, over 3.5 million coins are inserted in vending machines located in the United States alone. That translates into approximately 12.5 million coins every hour. Because vending machines do not take vacations, this goes on 24 hours per day, 365 days per year. Over 8 billion confections and snacks sell through vending machines annually! These estimates were accumulated several years ago in the 1990's when the total annual vended sales volume was at approximately 25 billion dollars. That was approximately $90 per capita. It is important to remember that 66% of all vending in the U.S.A. is owned by independent owner-operators, most of whom have less than three employees and manage their business from their home.